The study below looks at instances of SPX and VIX both closing positive on a Friday. The VIX has a tendency to move opposite the SPX, so when they move in the same direction, it can often suggest an edge over the next few days. Due to calendar effects the VIX has a natural tendency to sink on Friday afternoons as we approach the weekend. So seeing the SPX and VIX both rise is less common on Fridays than any other day of the week. This is why I use Friday as a filter in the below test. Note that I also included a long-term trend filter. And even in an uptrend the numbers here suggest a short-term downside edge. When SPX hit a new 200-day high last Thursday (Feb 16), doing so deemed the 10/18/11 Follow-Through Day (FTD) “successful” according to the possible definitions of “success” I included in the FTD studies. Based on the FTD studies, it is not a surprise to see this FTD turn into a successful rally. It had several strong positives going for it. For one, it occurred in conjunction with a 20-day high. 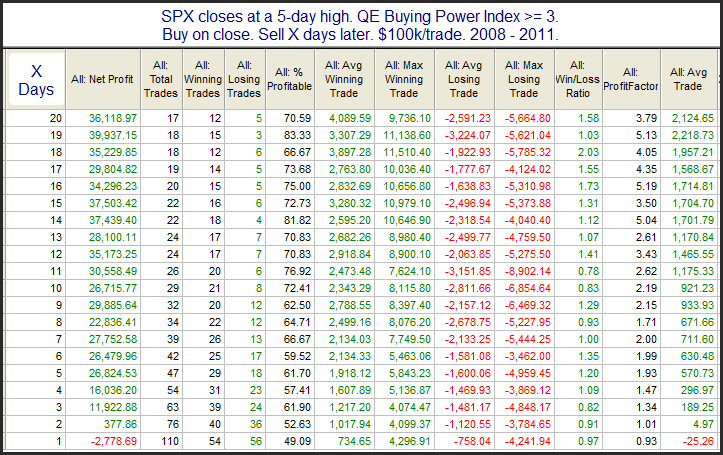 Secondly, it was accompanied by strong breadth. And third, it occurred after the 10th day of the rally (which Investors Business Daily says is a negative but 8 of the 9 FTDs that have come after day 10 have now been successful). There were some mild negatives that this FTD had to overcome – namely the fact that it occurred under the 200ma, and that it occurred after a substantial market decline. For those interested in learning more about FTDs, there is a bevy of information available on the blog under the “IBD Follow Through Day” label. And for anyone interested in purchasing the Tradestation code to study FTDs in more detail on their own may do so here. Friday is the last trading day before the President’s Day holiday. The day prior to many holidays we see a bullish tendency. This is NOT the case with Presidents Day. Over the last 20 years the Friday before President’s Day has been a very poor performer. I showed this last year in the 2/18/11 Subscriber Letter. I have updated the results in the table below. Due to popular demand and a very positive response I have decided to hold one more live webinar on Wednesday at 12:15pm EST for the QE Buying Power Index. After that I don't anticipate any more live webinars being held in February. If you'd like to attend you may go here to register (and to find links with more information). Below are a few brief clippings from emails I received from attendees last week. "I thought it was a GREAT VALUE!!" "Rob, I thought the webinar was fantastic: 1. It started on time. 2. It got the point across in an appropriate amount of time and 3. was professionally done… I quickly played with the indicator against one of my MR systems (long and short) and can see the indicator helps. I loved your webinar…I also like your style as far as finding numbers and stats to back your decisions. So if you want to attend the Wednesday webinar (or if you can't make it and would just like to view the recorded version), here's the link again. Big gap down from yesterday's high. Below is one way to look at it. These results were similar to a few scenarios I ran. The evidence suggests no edge in trying to buy the low open. In fact there may be a bit of a downside edge from open to close today. Historically, things have gotten worse throughout the day. There were a few studies related to VIX action that appeared in the Quantifinder yesterday afternoon. This particular study looks at large mid-week rises in the VIX during times the SPX is closing at a 50-day high. All results are updated. New readers may wonder why I use a day-of-week filter with this study. The VIX has a natural tendency to fall on Fridays and rise on Mondays. Because of this I typically separate out those days from the rest of the week when conducting VIX-based studies. Implications of the rising VIX and 50-day SPX high appear to be moderately bearish over the next few days, suggesting a pullback. The market was down a little and no one seemed to care. Volume was extremely light, and the range was the lowest in months. This kind of indifference can sometimes mean that bulls are done (temporarily). They pushed prices higher leading up to Monday then held a buying strike. Often this kind of action will be followed by sellers entering the market to fill the vacuum that is being created with the buyers leaving. A number of studies triggered yesterday that exemplify this concept. Below is one. Such extremely low range on a day the SPY dips a little has commonly been followed by a further drop. I will note that the short side does not have the QE Buying Power Index in its favor...but it will soon. On Friday I introduced the QE Buying Power Index and showed results over the 2008-2011 period when looking to buy pullbacks with a strong QE Buying Power Index reading versus a weak one. Today I’ll show the other side of the coin. Below is a short-side version of the same swing trade system. 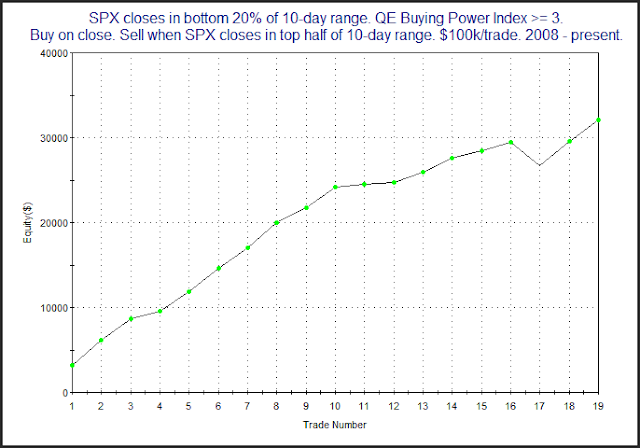 On Friday the system I used to demonstrate the importance of buying power simply bought the SPX when it closed in the bottom 20% of the 10-day range and then sold it when it closed back in the top half. Today we’ll look at shorting closes in the top 20% of the range and covering in the bottom half. First let’s look at times when the QE Buying Power Index was positive. As you can see, when the QE Buying Power Index has been positive, trying to short overbought market readings has been futile and there has been no edge in doing so. But now let’s examine results when the QE Buying Power Index was NOT positive. We see here a remarkable difference. Simply taking buying power into consideration changes the results dramatically. Over the last 4 years buying power has been extremely important in determining market movements. In the special (100% satisfaction guaranteed) webinars later this week I will explain to traders the concept behind the QE Buying Power Index and teach them how to calculate it. I’ll discuss how the it has influenced the intermediate-term over the years and how you can use it to swing trade with a system like those I’ve discussed the last few blog posts. Click here for more information on the webinars and to register. A market variable that I rarely see discussed and almost never utilized is Buying Power. And while it has become easily measurable and quantifiable over the last several years, I have found very little information on the concept. In some special webinars next week I will unveil the new QE Buying Power Index. 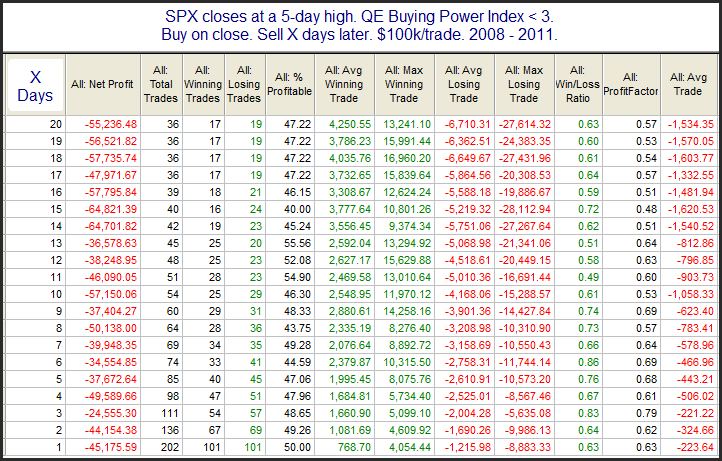 The QE Buying Power Index can be used to help determine whether a reversal or a continuation of a move is likely. Below is a simple swing trading system that demonstrates the value of the QE Buying Power Index. To see its impact on performance let’s examine a simple swing trading system that looks to buy pullbacks. The pullback approach is very simple. The swing system buys SPX whenever it closes in the bottom 20% of its 10-day range and holds it until it closes in the top half of its (then current) 10-day range. In the performance report below you can see how SPX performed from 2008 – 2011 when pullbacks were bought and the QE Buying Power Index reading was low. While there were a few more winners, the size of the losers was much higher. Buying pullbacks in this way would have produced more frustration than profits. It was essentially a breakeven strategy over the 4-year period. But now let’s look at results when the QE Buying Power Index was providing strong readings. The numbers here are outstanding. 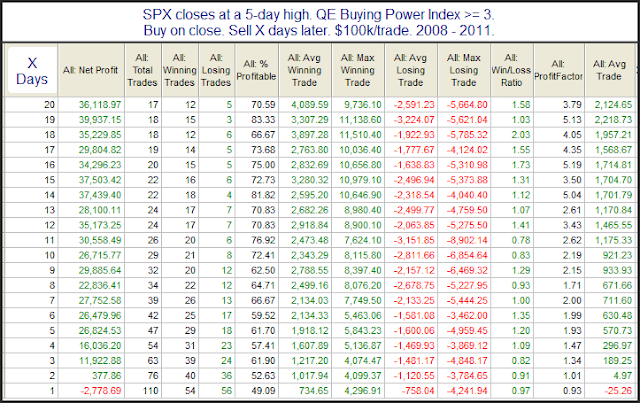 With strong buying power present pullbacks provided high probability opportunities. Let’s take a quick look at a profit curve to see how the steady the gains were. Profit curves don’t get much more appealing than that. So what is the secret, and how can you compute the QE Buying Power Index yourself? Register for one of the webinars and find out! The cost is only $25.00, and while performance is never guaranteed, your satisfaction with the information presented is – 100%. For more information and to register for an upcoming webinar click here. Employment days have an interesting history and they have contributed to some worthwhile studies over the years. 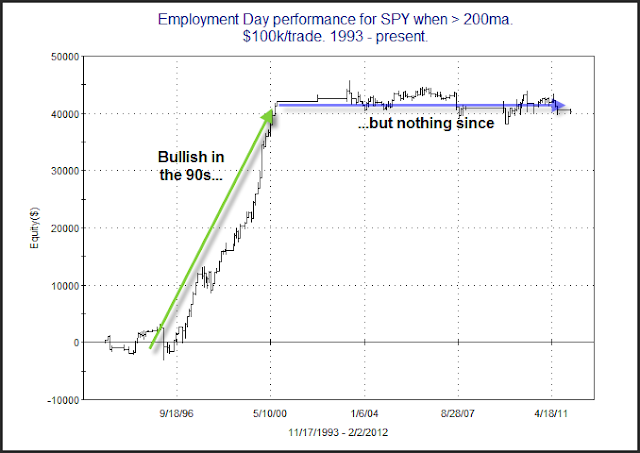 Below is a chart of SPY performance on Employment Days. For this equity curve I filtered to only include days where SPY was > its 200ma. Each trade was a fictional $100k. What I find so interesting about the chart is that for a long time Employment Days in uptrends showed a strong propensity for gains. But in 2000 this edge vanished. Since then there has been no apparent advantage – bullish or bearish. When breadth posts solid numbers and the SPX declines (during an uptrend) that has often been followed by a rebound in the next few days. The study below triggered at Tuesday’s close. It is one I have shown several times in the Subscriber Letter. The edge isn’t huge, but it does appear to be fairly reliable. Much of the edge is realized within the 1st 2 days.